Cody in front of his work while hanging his exhibit before the reception. On October 8th, 2016, Cody attended his feature at the Hive Gallery and Studio’s opening. 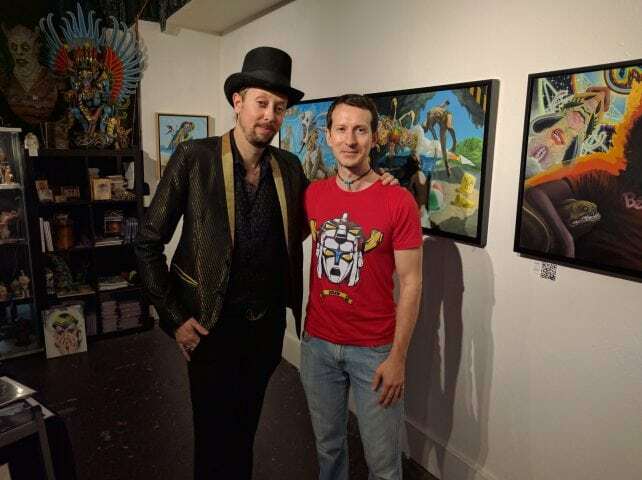 Even before the show opened, a renowned collector, Sheldon Donig, snatched up one of Seekins’ favorite pieces, “Scion of a Budgie-Sattva”. The exhibit turned out great crowds, who were very keen to engage the work in discussion. 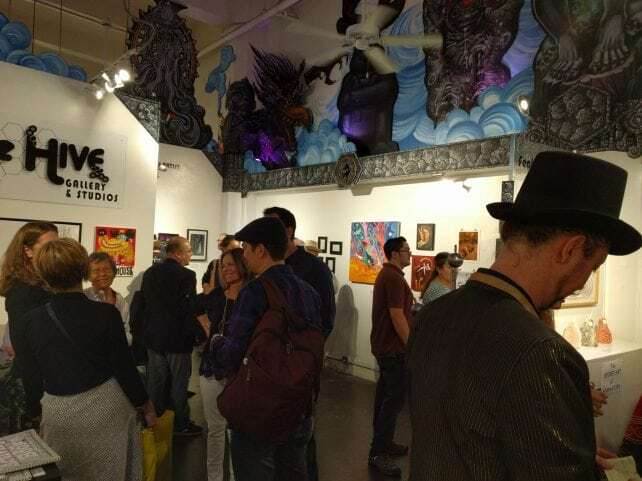 Proceeding deeper into the venue, the exhibit blended into works by modern animation industry professionals, “The Art of Animators” show, and a “Saturday Morning Cartoons” group exhibit. 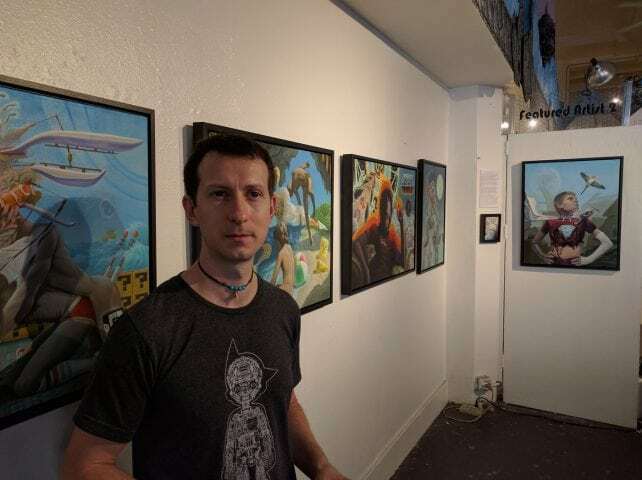 It was good to be back at the Hive as a featured artist. Cody’s last feature and visit to LA’s downtown art scene occurred in 2011. 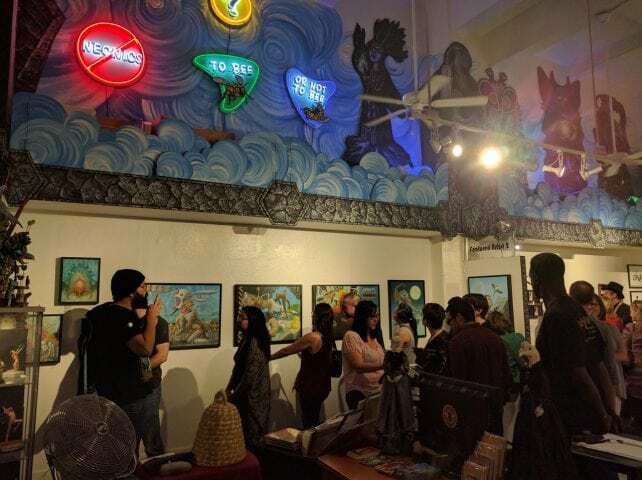 Since then The Hive Gallery and Studios has grown in reputation, and continues to thrive as a vital component of downtown’s Gallery Row. After the reception, the Hive crew, as well as Cody and his fiance, attended an after party in a late night basement “Peking Tavern”. In the process Seekins had the great pleasure to meet Paul Whitehead in conversation. Paul is well known for his graphic artwork for album covers of bands such as Genesis and Van der Graaf Generator. More information on Paul can be found on his Wikipedia page, or his professional website. With the opening come and gone, the exhibit will continue to hang for visitors and patrons to view until October 29th, 2016. In the meantime, Seekins heads to Cancun as his new creative station.